Perhaps you have seen this image taken from the space station. It's been in the news a lot in the last couple of weeks. To the left is Lake Superior to the right is Lake Ontario. 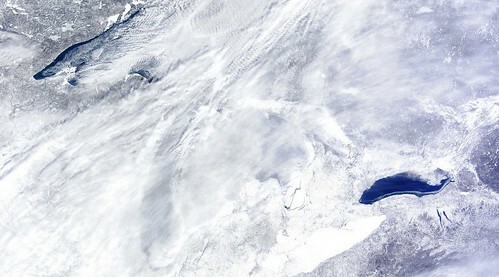 In the middle, almost completely obscured are Lakes Michigan, Huron and Erie. Around here, a big deal has been made of Lake Michigan being 90% covered in ice. The Coast Guard has had one of their biggest ice breakers in the far southern tip of the lake, breaking the ice so essential goods can travel by barge out of Chicago and Gary, Indiana harbors. Three weeks ago, a TV news crew went with them and the crew said it's one of the worst winters they have seen for lake ice. They think they get a channel cut and two days later, it's frozen again. Here we are in March and, true to the aphorism, "In like a lion, out like a lamb", we got a heavy snowstorm on March 1st. Yeah yeah. It's pretty, but Ive grown exceptionally tired of it. 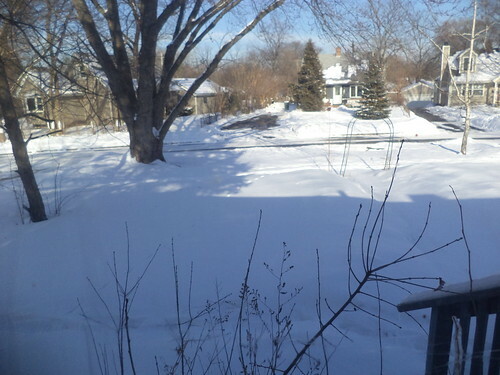 There is beauty in the pattern of white snow and blue shadow cast by an afternoon sun but I came down with a cold, the first heavy cold I've had in several years and this limited anything I was going to do, including shovel snow. Of course, that makes me frustrated because it needs to be moved from one location to another because it's too deep to be walked through in just shoes. I have to wear my boots and, as much as I like my boots, I'm tired of putting them on; of ear muffs, of scarves, of zippers and snaps and gloves. Just tired of winter in general. The weather people were quick to say that meteorological winter arrived at the end of February, all the while telling us there would be two more storms dumping snow on Chicagoland this week. As I type this, the 3 incher is outside, spitting white flakes in flurries and raging torrents. 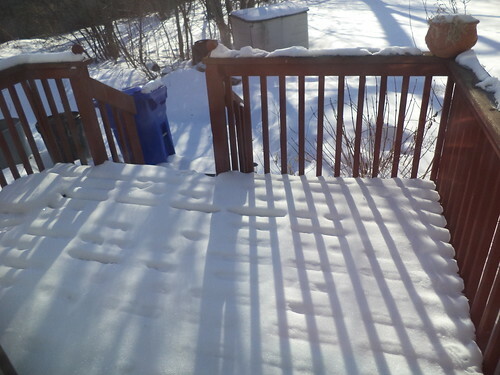 I was well enough yesterday to shovel the deck, out to the car and the front steps out to the mailbox. So much for that. There's nothing one can do besides yell outside when you've moved more snow, "Stop already" and know that Mother Nature is laughing. She seems more like a character from a Terry Pratchett Discworld novel this year than she ever has. I do wonder what we've done to honk her off so much that she insists winter be with us and her coat of snow covering the land for a long time. And when you're sick and the thought of moving yet another 3 inches from point A to point B makes you physically weak in the knees, you feel you will strangle another cheery weather person who says, "Well, we are in meteorological spring". Stick it where the sun don't shine. I spent Sunday and Monday either sleeping or in the recliner reading. The only good thing about being sick is that I'm pretty much immobile, excepting the times I need hot tea. 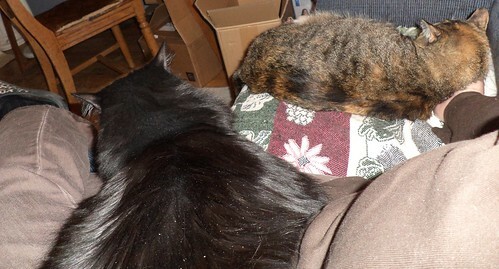 That means my lap is not mobile. That means, while I watch "Easter Parade" and then read, I have the benefit of both girls. 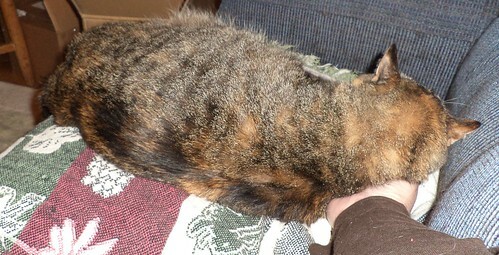 Mija loves to flop onto my hand and gets her chin and head scratched. Pilchard simply settles in, stretches out and goes to sleep. I haven't been coughing much with this cold so there isn't a wracking hack which would shake Pilchard and cause her to leave. Mija has always seemed scared of sneezes and coughs so she bolts when either of those occur. But, for about 2 hours, we are a happy trio. It's rotten that there is more snow and no sign of spring. It's rotten that the current projections are that we will have a colder than normal spring because the lake is 90% frozen. It's rotten that a cold finally nailed me. Yet, when it's us, dozing in the recliner, watching the news or a lovely Fred Astair movie or just reading book number 2 for this year, we can, for a moment, set aside the next snow storm.